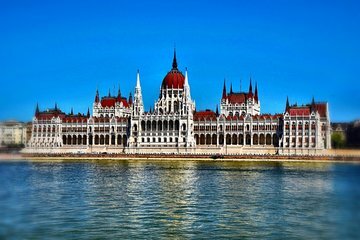 Veja mais das atrações de Budapeste em menos tempo e com mais facilidade do que você poderia, independentemente, com este tour privado de meio dia. Esqueça-se de explorar os pontos de referência a pé ou de transporte público, e navegue de um local para outro em um veículo particular com ar condicionado, com um guia para fornecer informações e informações básicas. Além disso, personalize seu itinerário para se adequar a você, para que você tenha uma visão totalmente personalizada e sem problemas da capital da Hungria. Viator never fails to exceed our expectations and this tour was no exception. We were promptly met at the docks of our river cruise. Our guide George was very friendly, informative and accommodating. We were taken to several sights that were not on the cruise ship's itinerary. In addition, our tour also included the typical sights such as the Budapest Cathedral and the Parliament Building. There was very little walking since George parked close to the sights. George always pointed out the public restrooms. He took pictures of my husband and myself and somehow found the best locations for these pictures. He must be a professional photographer. I specially wanted to shop for chocolates. George took us to several chocolate shops. We were able to sample chocolates thanks to George. He spoke to the shops for the best selections of chocolates. I would highly recommend this tour. It was a 3 hour private tour tailed to our needs. We felt safe and were treated with respect. The cost of this tour was worth every penny and would far exceed the cost if you purchased several individual tours to accommodated your need.